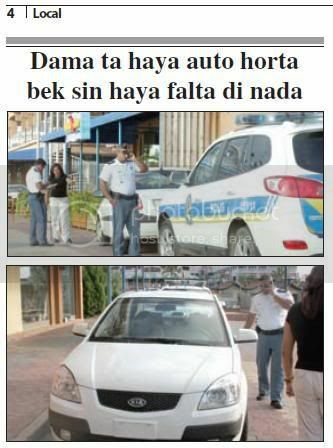 ladronnan of car owing to become cu they do not respeta neither if the car is stop in cura of cas. diahuebs night, he l.a.v. owing to bay keep of police at santa cruz y is haci denuncia of ladronisia of his car nissan centra blanco model b-14, number a-19547. the is tell police cu 10 or of night, past owing to arrive his cas at macuarima, y owing to hinca his car in cura y owing to sere at key. for 12’or of night, hour cu past owing to hear cachonan is blaf, past owing to arise for throw one view kico is pasando. the is tell police cu past owing to see his car is core leave for of his cura. presencia of police owing to wordo ask diahuebs night 8.30 fast of the business the paddock, at where one person owing to wordo atraca. n’e sitio police is talk cu the victima j.a.d. that is tell police cu one person on bromer cu cabey largo, owing to happen y ranca his bag in cual the had 27 dollar. according his declaracion cu one witness owing to bise cu the person on the bromer was one child muher y past owing to give descripcion of dje. 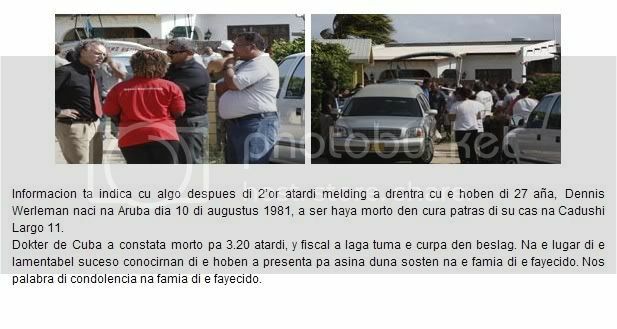 according the witness owing to tell cu some rato first the child muher ey, was sit is come in the restaurant, dress cu blouse roos, short blanco, cabey blond y color cla. past owing to core bay on one scooter orange-coloured. presencia of police of north was solicita at one cas at cununcu abao, 9.30 of morning, where one pareha have problem cu another, by cu he owing to coy coin of pay number of car. n’e sitio police is talk cu the muher m.t.e. naci at aruba of 45 year, that is tell police the his casa cu he the.r., naci at aruba of 47 year owing to fight cune y owing to coy 250 guilder, cu the had for pay number of car y owing to bay cune. 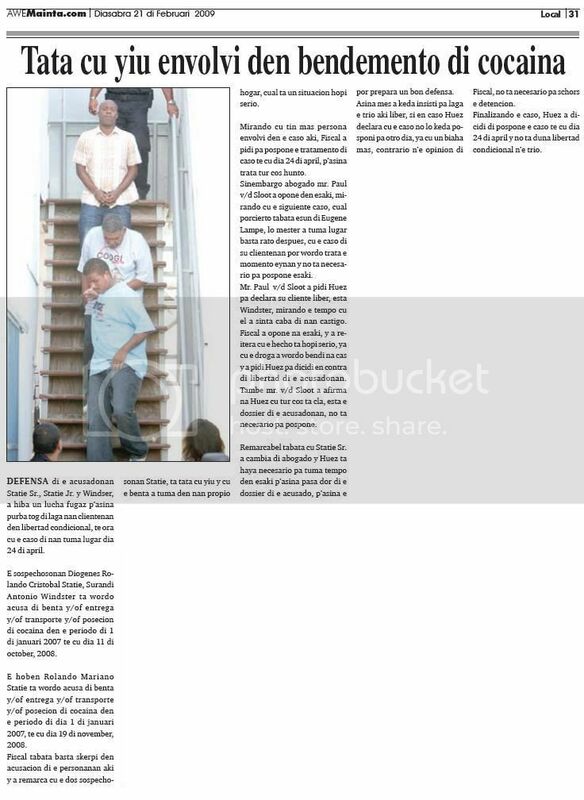 police owing to compaña the muher m.t.e. at one cas at cunucu abao, for busca the coin serca he. at cuminsamento past owing to deny serious cu the had the coin, but owing to dicidi of bay at the cas where the coin is. 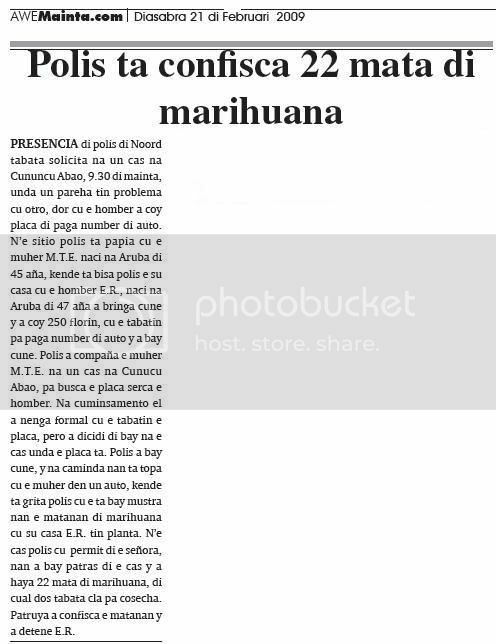 police owing to bay cune, y at caminda they're come across cu the muher in one car, that is bark police cu the is bay show they the matanan of marihuana cu his casa the.r. have plant. n’e cas police cu permit of the madam, they owing to bay behind the cas y owing to achieve 22 kill of marihuana, of cual two was cla for cosecha. patrol owing to confisca the matanan y owing to detene the.r. diahuebs afternoon, during cu police was of patrol, they're wordo stop for one madam in ranchostraat, that is tell they cu two choler owing to enter in the business cu the is work y owing to bay cu some cloths. the is tell police cu one trahador is behind the cholernan. police owing to see the trahador behind the cholernan y owing to bay yud’e. in emmastaat, the cholernan owing to enter in the edificio ex texas y owing to leave for one another door, after they owing to core bay in ranchostraat. one of the cholernan owing to enter in one cas in ranchostraat. police owing to enter his slow y owing to detene the conocido choler thief chito dirksz. past owing to stay deteni for ladronisia. defence of the acusadonan statie sr., statie jr. y windser, owing to take away one struggle fugaz p’asina try tog of let they clientenan in freedom condicional, till hour cu the caso of they take lugar day 24 of april. 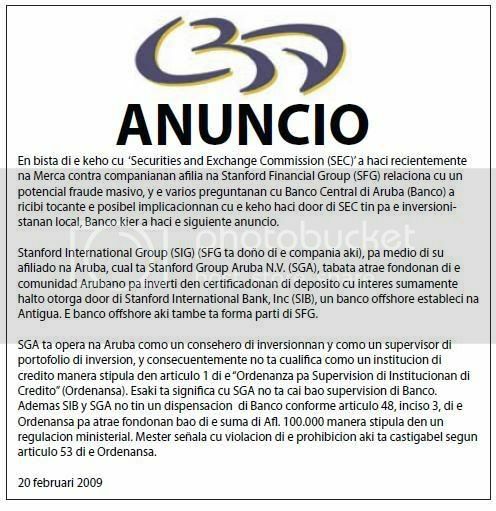 the sospechosonan diogenes rolando cristobal statie, surandi antonio windster is wordo acusa of throw y/of entrega y/of transporte y/of posecion of cocaina in the period of 1 of january 2007 till cu day 11 of october, 2008. the young rolando mariano statie is wordo acusa of throw y/of entrega y/of transporte y/of posecion of cocaina in the period of day 1 of january 2007, till cu day 19 of november, 2008. fiscal was enough skerpi in acusacion of the personanan here y owing to remarca cu the two sospechosonan statie, is father cu child y cu the throw did take in they own hogar, cual is one situation much earnest. mirando cu have more person envolvi in the caso here, fiscal owing to ask for pospone the tratamento of caso till cu day 24 of april, p’asina deal all cos together. sinembargo advocate mr. paul v/d sloot owing to opone in this, mirando cu the next caso, cual porcierto was esun of eugene lampe, will have to did take lugar enough rato after, cu the caso of his clientenan can wordo deal the instant eynan y do not necesario for pospone this. mr. paul v/d sloot owing to ask huez for declara his cliente pound, esta windster, mirando the time cu past owing to sit end of they castigo. fiscal owing to opone at this, y owing to reitera cu the mature is much earnest, already cu the drugs owing to wordo bendi at home y owing to ask huez for dicidi provided that contra of freedom of the acusadonan. also mr. v/d sloot owing to afirma at huez cu all cos is cla, esta the dossier of the acusadonan, do not necesario for pospone. remarcabel was cu statie sr. owing to change of advocate y huez is achieve necesario for take time in this p’asina happen by of the dossier of the acusado, p’asina the can prepara one good defence. so self owing to stay insisti for let the trio here pound, if provided that caso huez declara cu the caso not will stay posponi for another day, already cu once more, contrario n’e opinion of fiscal, do not necesario for schors the detencion. finalizando the caso, huez owing to dicidi of pospone the caso till cu day 24 of april y do not give freedom condicional n’e trio. 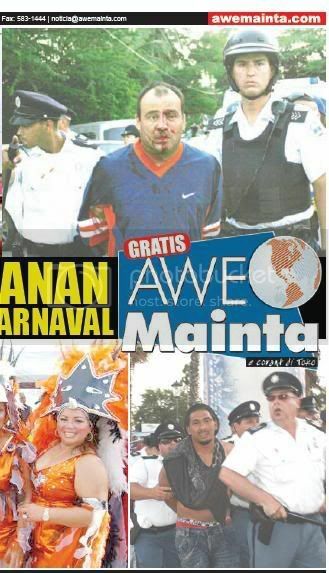 papito comenencia, vocero of police wanted give at prensa one resumen of the incidentenan during the weekend of carnaval big. had one overall of 46 detencion during the two paradanan. 11 was at san nicolas. of esakinan 6 owing to pay one multa (total afls 1300,--). one of the detencionnan was relaciona cu maltrato cu arm y 4 deteni for drunkenness y can owing to bay cas after of owing to sosega they body. 35 was at oranjestad. of esakinan 15 owing to pay one multa (total afls 4250,--). 10 detenido owing to achieve one call for aparece fast huez already cu they not can owing to pay. 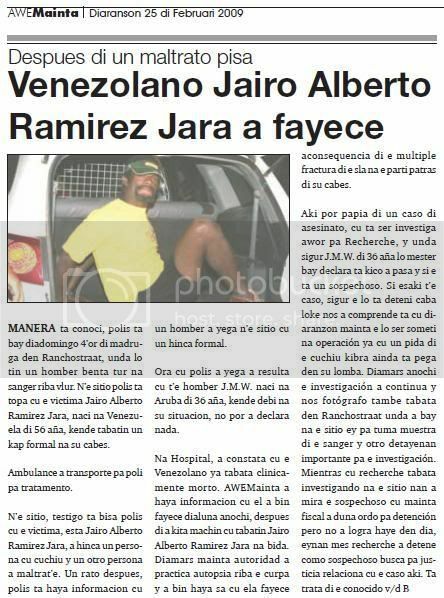 1 detenido owing to being encarcela for attempt of asesinato. 1 detenido owing to being encarcela for core car bao influencia. 8 detenido owing to being close for drunkenness. another delitonan cometi ta: bringamento; stroba parada; not follow ordo of police y drunkenness publico. police is achieve informacion cu saturday 8.10 of night one man will owing to arrive at one cas at lagoweg, cu one hinca serious at his curpa. hour cu police owing to arrive n’e cas, owing to resulta cu already owing to transporta the victima for centro medico for tratamento. police owing to bay centro medico y eynan they're talk cu the doctor at keep, that is confirma cu the victima owing to.w. owing to come eynan, but cu past owing to deny tratamento y owing to company p’esaki. relaciona cu the hincamento here, two person, one brother man y girlfriend of he owing to.w. owing to bay keep y is tell police cu one primo owing to tell they cu owing to.w. owing to achieve one hinca at his pecho, in sint maartenstraat among 1.30 for 2.30 of madruga. the primo here self t’esun cu is come across cune in sint maartenstraat on caya at blood. they owing to transporte for centro medico, of where past owing to bay cu urgencia at poli at hospital, for tratamento, already cu his situation is delicado. testigonan owing to tell cu is 3 person owing to fight cune. witness owing to reconoce one such billy y supuestamente uno cu calling prins owing to hinke. the caso is bao of investigacion. 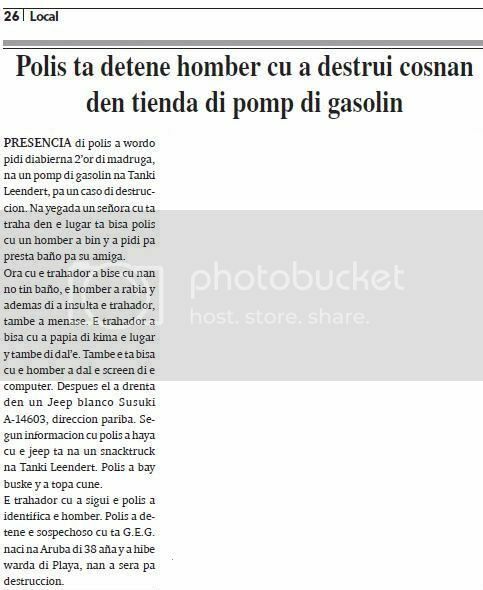 presencia of police owing to wordo ask diabierna 2’or of madruga, at one gas station at tanki leendert, for one caso of destruccion. at arrival one madam cu is work in the lugar is tell police cu one man owing to come y owing to ask for presta bathroom for his girlfriend. hour cu the trahador owing to bise cu they not have bathroom, he owing to angry y apart from owing to insulta the trahador, also owing to menase. the trahador owing to tell cu owing to talk of burn the lugar y also of dal’e. also the is tell cu he owing to strike the screen of the computer. after past owing to enter in one jeep blanco susuki a-14603, direccion east. according informacion cu police owing to achieve cu the jeep is at one snacktruck at tanki leendert. police owing to bay buske y owing to come across cune. the trahador cu owing to follow the police owing to identifica he. police owing to detene the sospechoso cu is g.e.g. naci at aruba of 38 year y owing to hibe keep of beach, they owing to close for destruccion. police of north, is bay at one hotel highrise, diabierna 2.30 of madruga, at where according the first informacion cu a will wanted sende one bedroom at candela. hour cu police owing to arrive owing to resulta cu is ladronnan owing to enter in the bedroom. the tourist d.b. naci at estados unidos, that is declara cu the was sleep in his bedroom cu his casa, y owing to hear one desorden in sitting-room. hour cu past owing to leave, past owing to see one man color dark sit in the sitting-room. at instant cu the thief owing to see the tourist, past owing to core bay, lagando one bag cu some can of ale behind. hour cu the tourist owing to bay controla, past owing to see cu in the balcon of the bedroom had one man color blanco is keep on dje. they all two owing to core bay. the tourist not can owing to give descripcion completo of the two hombernan. police owing to bay haci investigacion y owing to resulta cu one window owing to stay open. do not conoci if the hotel have guardia is patrol rond. 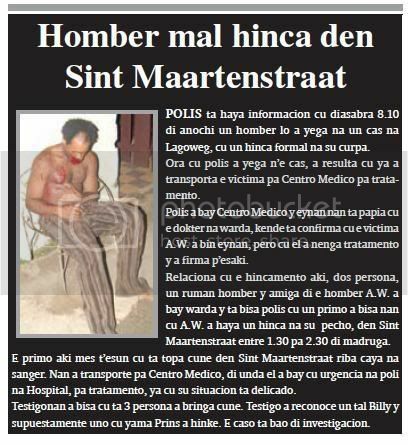 one inhabitant cu live in kolibriestraat, is calling police y is haci denuncia of ladronisia for of his cas. the is tell police cu past owing to arrive 2.30 of madruga, y hour cu past owing to bay for busca algo of come in frigidair, past owing to see cu his frigidaire was miss cos in dje. past owing to bay controla the cas y owing to see cu desconoci owing to break window y owing to bay cu some cos.
police of santa cruz, diabierna morning for 8.30 is bay at one cas at lagabena, for one caso of ladronisia. police of santa cruz is bay y is talk cu one madam, that is tell police cu the is tirando view p’e cas. past owing to tell cu hour cu past owing to arrive n’e cas, past owing to come across cu one man diminutive y one muher dress cu muts in the cas. they had bag complete for bay cune, but owing to lague behind. the is tell cu they two owing to core bay in direccion north. police cu owing to arrive n’e asistencia, is corda cu at caminda they owing to come across cu the pareha is march bay. police owing to bay controla y they're come across cu one neighbour, that is give they some articulo cu the dosnan owing to let behind, cu is procedente of ladronisia. police owing to follow busca y at sombre they're come across cu the two personanan cu is cuadra cu the descripcion. police owing to detene he m.r.p. of 38 year y the muher g.w.p.di 47 year. police owing to achieve they cu one thirst of herment. the madam cu is cuida the cas is bay recherche for give complaint. 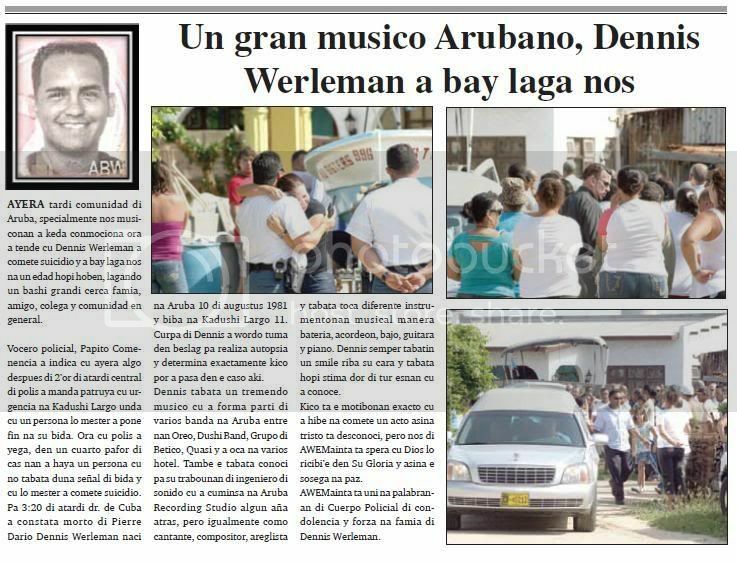 one great musico aruban, dennis werleman owing to bay let we yesterday tardi comunidad of aruba, specialmente we musiconan owing to stay conmociona hour owing to hear cu dennis werleman owing to comete suicidio y owing to bay let we at one edad much young, lagando one bashi big close family, amigo, colega y comunidad provided that general. vocero policial, papito comenencia owing to indica cu yesterday algo after of 2’or of nightfall central of police owing to send patrol cu urgencia at kadushi largo where cu one person will have to owing to place end at his life. 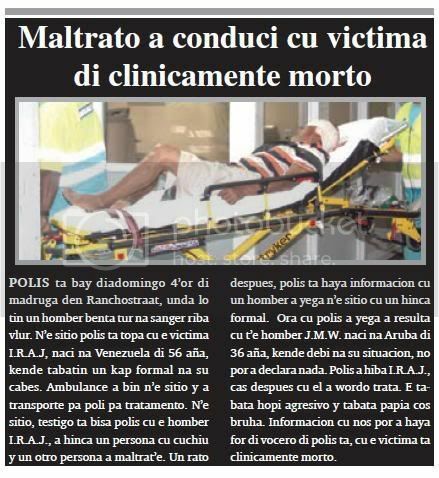 hour cu police owing to arrive, in one cuarto abroad of cas they owing to achieve one person cu not was give sign of life y cu will have to owing to comete suicidio. for 3:20 of nightfall dr. de cuba owing to constata dead of pierre dario dennis werleman naci at aruba 10 of august 1981 y live at kadushi largo 11. curpa of dennis owing to wordo take in beslag for realiza autopsia y determina exactly kico can owing to happen in the caso here. 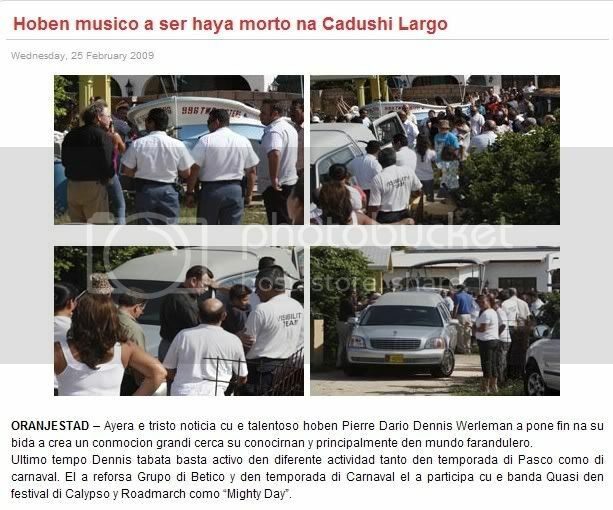 dennis was one tremendo musico cu owing to form part of several near at aruba among they ear, sweet band, are of betico, quasi y owing to oca at several hotel. also the was conoci for his trabounan of engineer of sonido cu owing to cuminsa at aruba recording studio some year behind, but igualmente because; cantante, compositor, areglista y was toca various instrumentonan musical as accumulator, acordeon, bajo, guitar y piano. dennis always had one smile on his cara y was much love by of all esnan cu owing to conoce. kico is the motibonan exact cu owing to hibe at comete one acto so tristo is desconoci, but we of awemainta is wait for cu god will ricibi’e in his glory y so the sosega at paz. awemainta is uni at words of cuerpo policial of condolencia y forza at family of dennis werleman. lady is achieve car steal bek without achieve miss of nothing. sospechoso dangerous, busca for enough day end, at last is behind trali for enough day end the sospechoso martina is being busca for maltrato y menasa. the sospechoso here is uno much dangerous y all hour the is arise contra police y fight cu they. ultimo trip martina staka one agent cu cuchiu. for of the time ey end the is being busca without result. but the recherchenan of oranjestad not owing to give-up, but owing to follow in his buskeda y was tuesday nightfall cu the recherchenan attentive owing to succeed mire y owing to core his slow, while owing to ask refuerso, but so self past owing to succeed core bay. one rato after they owing to succeed place hand on dje y owing to detene y now is behind trali, pendiente till day cu his caso hudicial come fast, p’e bay sit castigo, wait for pisa at kia.